Learn to understand the muscles you're working in order to get maximum results. I will discuss this and lay out a sample routine for you to try. The importance of good calves in bodybuilding cannot be overstated. How many times have you watched a contest only to see a guy with a great physique but small calves? It really detracts from the rest of his physique, doesn&apos;t it? The calves should be about the same size as your arms if you want them to be in proportion with the rest of your physique. But for many of us, getting the calves to respond is extremely difficult. As I said in my "Killer Biceps" article, you need to understand the muscles you&apos;re working in order to get the best results. I have to say that knowledge is definitely power when it comes to bodybuilding. The more you search out knowledge the better equipped you&apos;ll be to achieve great results. With that said, the calf muscles are: the Soleus - the largest calf muscle, the Gastrocnemius - this muscle actually has two heads, it also overlays the Soleus muscle, and the Tibialis Anterior, which actually runs up the front of the lower leg by the shinbone. The function of the Soleus is to extend and rotate the foot, the function of the gastrocnemius is to flex the foot and the function of the tibialis anterior is to elevate and flex the foot. There are only a few exercises for the calves, but some work different parts of the calves better than others. Standing Calf Raises is the main mass builder, but to fully activate the Soleus, you need to include Seated Calf Raises as well. 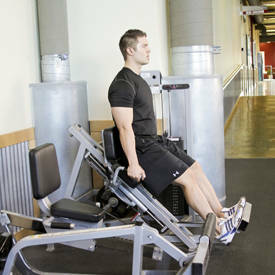 Then, of course, you have Donkey Calf Raises and Calf Raises on the Leg Press. You can use a lot of weight for calves, so the more the better in this case. It&apos;s common to use upwards of 600 - 800lbs. - for 12-20 reps - for standing calf raises. As long as rep performance does not suffer, use as much weight as you can. Those of you that read my articles know I talk a lot about proper rep performance. Too many people lift weights like they&apos;re in the Indy 500, fast as lighting but with horrible form. Watching these people, I have no idea what exercise they&apos;re supposed to be doing, it doesn&apos;t look like the one I thought they were doing and I guarantee they are not hitting the muscles they think they are either. I suggest two types of rep performance - slow and controlled, 3-4 seconds down and 3-4 seconds up, full range -all the way down and all the way up in order to get a good stretch and fast, explosive movements. During these faster reps, you still want to work through the full range of motion; you want to explode out of the bottom, and go all the way to the top. In both cases, keep a good "rhythm" going, no stopping and starting again, and think in terms of the set being one continuous rep. I also suggest two styles of exercise performance: heavy weight and low reps (6-8), and lighter weight for higher reps (15-25). Take your sets beyond failure using one of the following techniques: super sets, drop sets, forced reps, partials or rest pause reps. It would make sense to mix these up, use a different technique or two each week. I find for calves, a combination of these two styles of weight/reps and rep performance works best. Pointing the toes in different directions seems to affect different areas of the calves. I say this because it seems you will hear differing opinions on this one. Yet, the calves are a very hard muscle to see results, the daily use we put our calves through makes them a resistant muscle, circulation seems to be less than in other muscles, thereby preventing the full benefits from getting a good pump, so it makes sense to take advantage of any technique you can and this includes changing the way your feet are pointing. This is why I advocate two different rep/exercise styles in the same workout and also why you should take your sets as much beyond failure as you can. The calves should be trained at least once a week, with legs. I know there is more than one school of thought on this, but if you train the calves hard with a reasonable amount of sets, training them as often as you hit your thighs should be good. They get so much day to day use as it is, why overwhelm them with 3 or 4 or 5 workouts a week? Better to hit them really hard once, then train them on your next leg day. This allows the recovery process to work, remember, you grow in between workouts not during the workout. On all sets, keep rest periods to 20 seconds. If you do not have access to this equipment, use routine 1, but add 2 sets to the second exercise and take 2 sets off the first exercise, thereby shifting the emphasis on the Soleus muscle. These routines take advantage of the lower rep, heavy weight for growth concept but also bring in high reps to enhance the pump. Since circulation in this area can be a problem, this is important. Getting a good pump equates to increased blood flow which means an increased flow of nutrients are brought in to the area and waste products are taken out. Protein every 3 hours, protein and simple carbs in the morning and right after the workout, a moderate intake of complex carbs throughout the day, and fat kept low but focusing on the good fats. The point here is that it takes a combination of training techniques to get the best results from your calf training. Give this workout a try and see how much growth you can get.